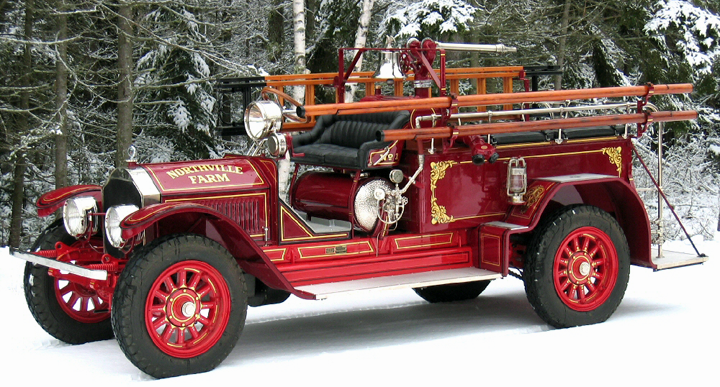 The focus of this website is just the painted and gold leaf decoration on American fire apparatus through the past two centuries. 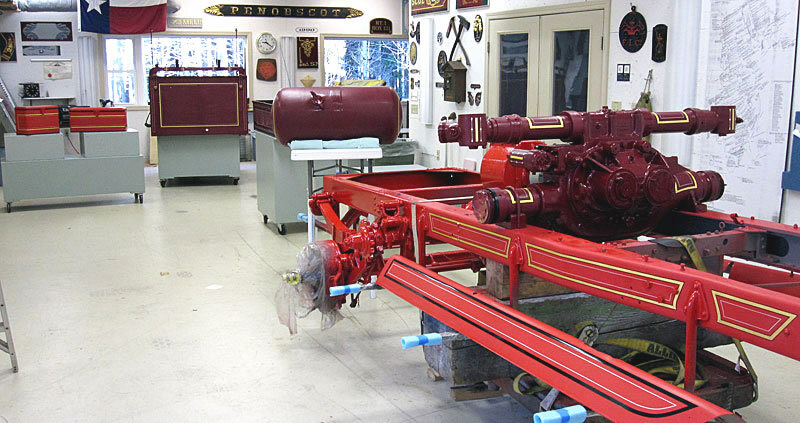 In this section you will find many close-up photos of restored engines to show their painted details. 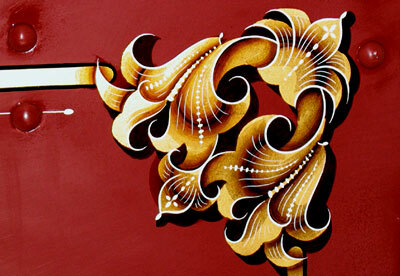 These decorations are historically accurate, and unlike modern style pin-striping in a few ways. Whenever possible I reproduce the designs that were on the vehicle when it left the factory. 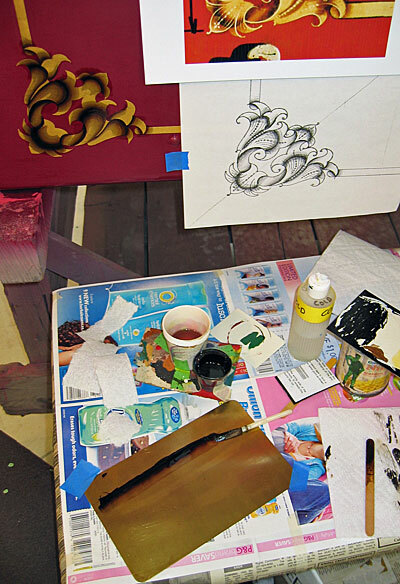 I carefully remove layers of paint to find the original paint job, which I document. I also search through old photos of vehicles for additional details and I visit museums whenever I'm near one. 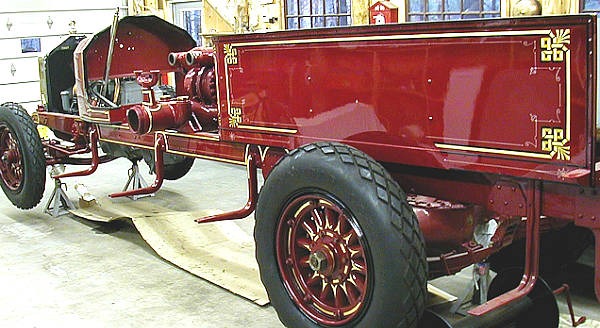 Most antique engines have been repainted several times. Few owners realize how elaborate their vehicle looked when it was new. These vehicles were the pride of the community. They were more than just a practical machine. They saved lives and protected whole neighborhoods from the awesome destructive power of fire. 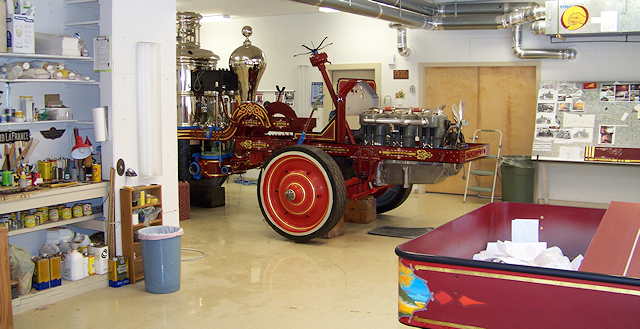 In 1972 I began my career in a shop that restored antique cars. 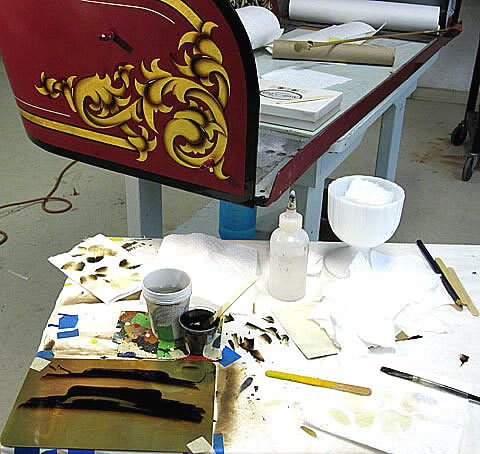 The phase of the restoration process that I enjoyed the most was the detail painting, pin-striping, and lettering. This led me into the sign painting profession. In the early 1980's I worked for a wagon shop. 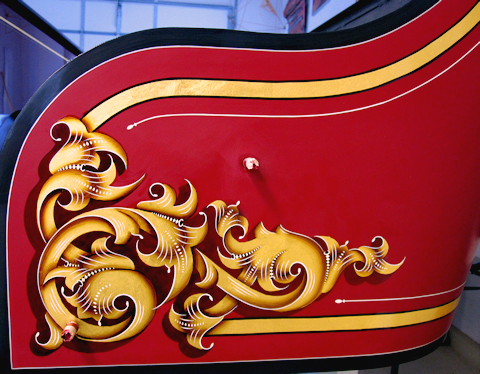 I found the traditional decoration on horse drawn vehicles more interesting than modern pin-striping motifs. 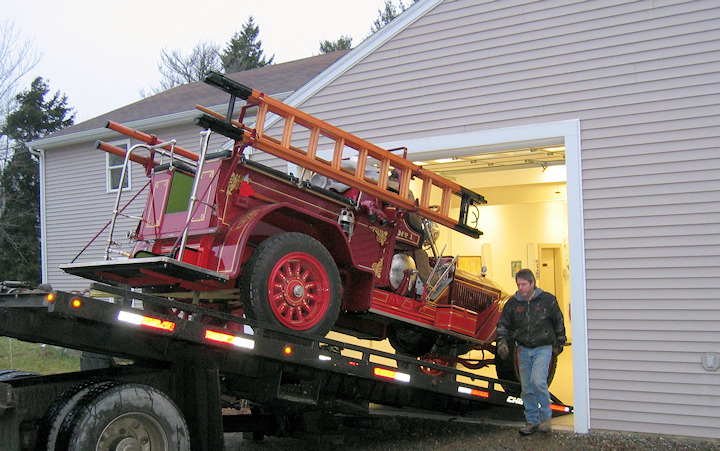 In 1985 I helped on the restoration of a steam fire engine for my local fire department. The following year I move to Maine and began working with Andy Swift of Firefly Restoration. Most of the photos on these pages are of projects from his shop. 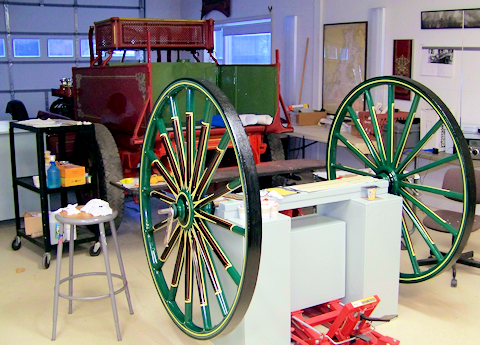 The following pages describe restorations I have helped with. They are divided into eras. 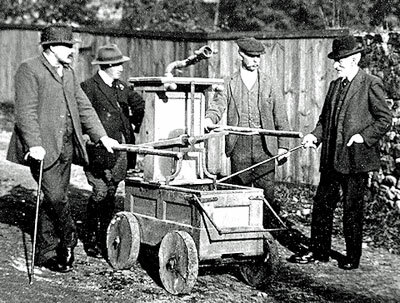 First is the era of hand powered engines. 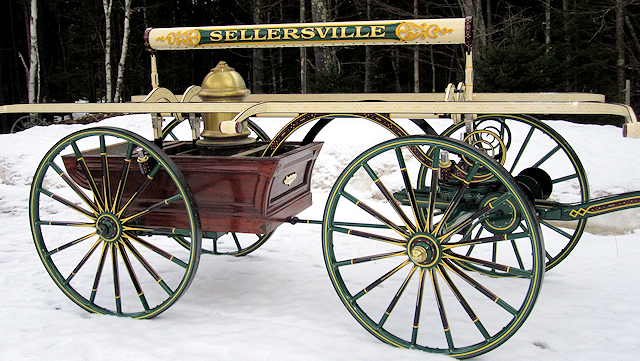 Next comes steam powered engines, and finally motorized apparatus. 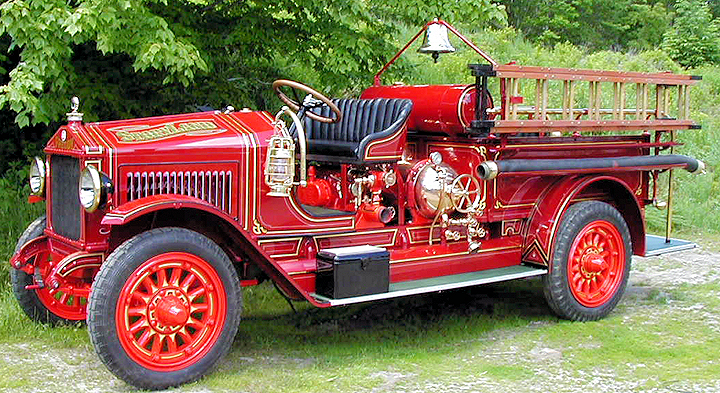 Photos of original paint jobs from these eras can be found in the second half of this web site. 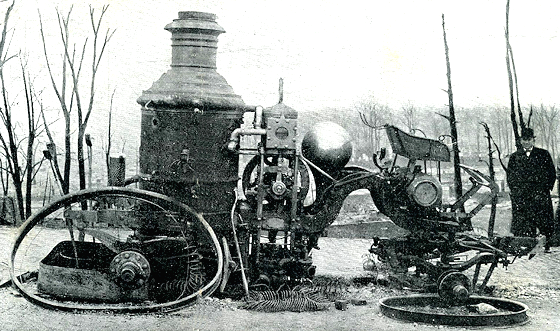 These early engines were in use from colonial times till about 1900. It took several firefighters to pull them, and many more to operate the pump. It was strenuous work, but still more efficient than the bucket brigades of earlier years. Large communities switched to these engines between 1850 and 1910 . A coal fired boiler powered the pump. 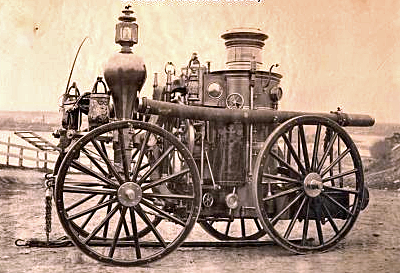 Fewer firemen were needed and the pump could work continuously for many hours. Most of these heavy machines required horses to pull them. 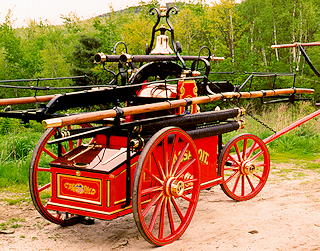 The last of the steam pumpers were pulled by gasoline powered tractors. 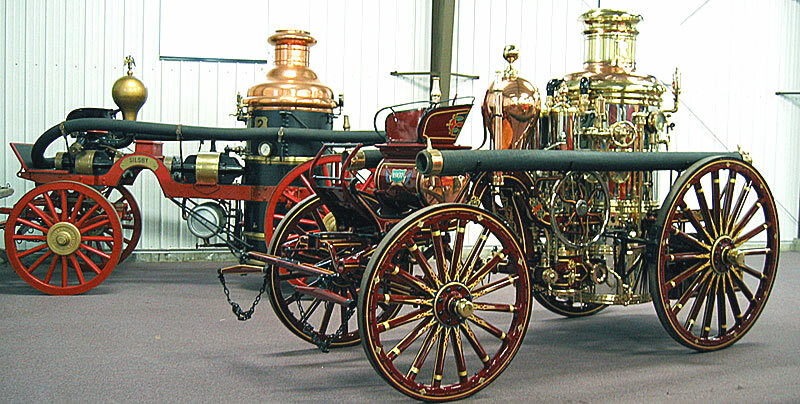 Soon after 1900 many steam engine manufacturers began experimenting with gasoline powered vehicles. 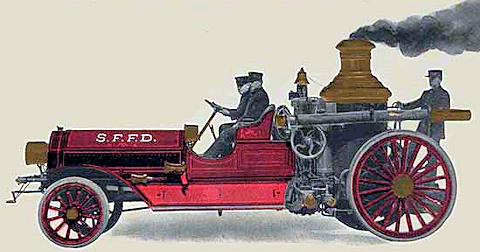 Companies such as Ahrens-Fox, American LaFrance, Maxim, Mack and Seagrave each had a unique scheme of decoration for their trucks. 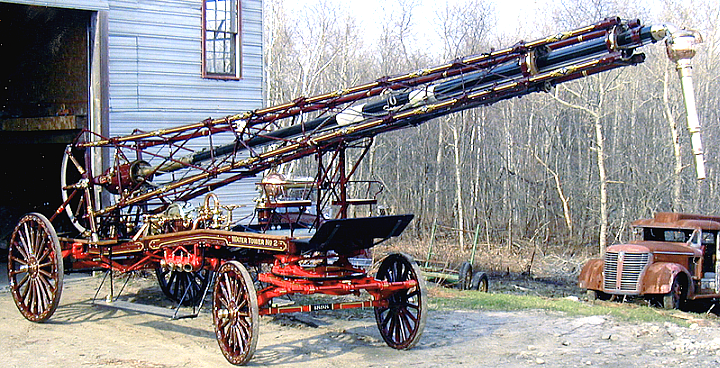 Mechanical and historical aspects of these fascinating machines are not dealt with in any detail here. There are other web sites and books that can help you with these interests. The People & Places links page can direct you to some sources of information.